Blue is the water element and is a cool color. It signifies peace, coolness, stillness, serenity and calmness. Green is an earth colour and denotes coolness, peace, freshness and fertility. Both are complementary colors on the colour wheel. They are separated by yellow. The yellowish green shades are warmer shades and the bluish yellow shades are the cooler shades. The colours are in diverse shades and may need the support of a neutral shade like white or cream to balance it out. The green and blue colors are cool colours and there is a real danger that the kitchen might end up being sterile and cold. Brighten the room with the yellowish green shades to reduce this trait. You may add shades of yellow or cream to balance the color palette. Green shades like mint, leaf green, bright green are best suited with darker shades of blue like azure, or dark blues like navy and cobalt. 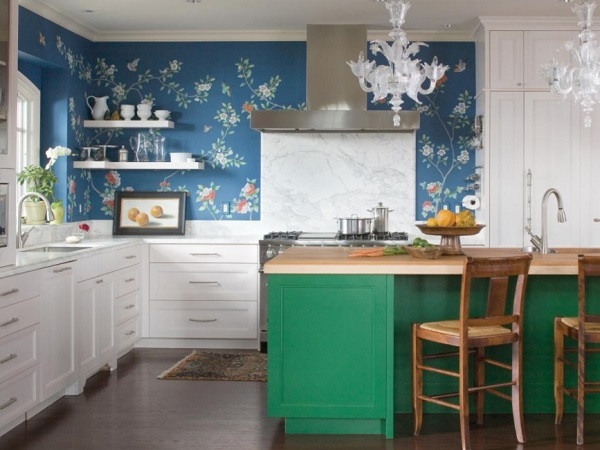 “Eggshell blue walls and lime green cabinets, balanced by white countertops and floors, a vividly patterned blue and green backsplash and jewel blue appliances and cookware looks sensational. Add some interest with a gauzy white window treatment and a large red vase to add accent, add dark green foliage and bright flowers in the vase to create a focal point, and you have a complete look,” says decorator Sarah Jones. 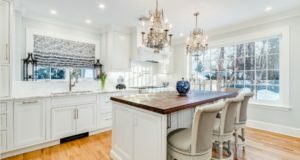 “Use white appliances like the refrigerator and the stove to balance the look. A bright chrome chimney and door knobs add depth. The backsplash can be a bright yellow to add a splash of warmth. The same yellow can be used in the floor mats and accessories to add warmth, as blue and green make for a very cool combination and need warm colours to complement them,” Raison added. Sky blue walls with white cabinets are a classic color combination. Add a dark navy blue granite countertop and Luxury Vinyl tile floor, A red backsplash to add character. A white window treatment and cookware add balance. To finish, add accents of green as the focal points of interest as an interesting wall decor or a vase can add freshness. White and blue patterned walls add space to a small kitchen. Add a white cabinet and floor to reflect light. 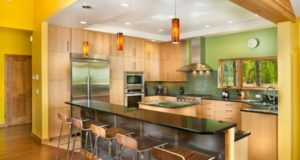 Add a green backsplash and countertop to create a pleasant and spacious feel Add a yellow stool and foot mat to add a splash of color to brighten up the kitchen, and you have a clutter free, clean look. It is very important that you add a splash of a warm colour to avoid the kitchen looking cold. Keep the space clutter free and clean. Go ahead and enjoy your cozy little haven!